A Virtual Aid to Navigation cal survey and analysis primarily knowing that this sof ware provides the is created when a signal sent from a transmitter to the oil and gas industry. 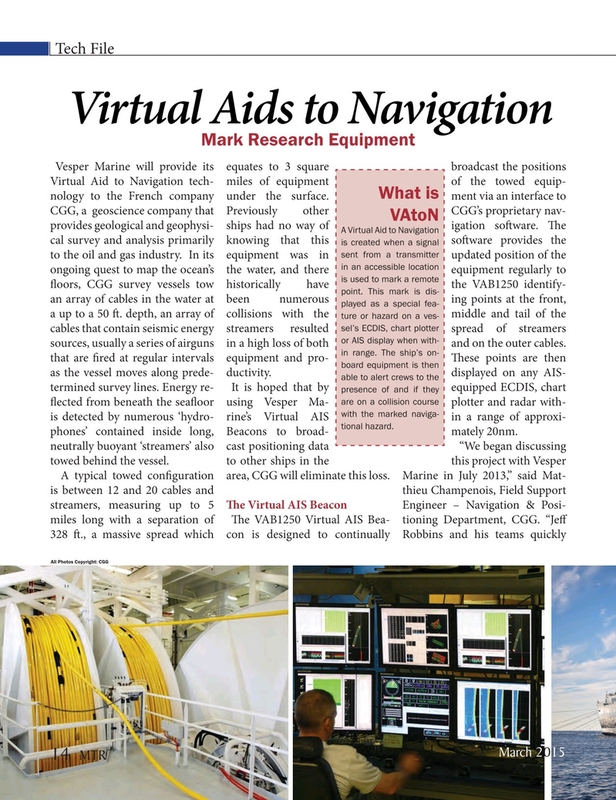 In its equipment was in updated position of the in an accessible location ongoing quest to map the ocean’s the water, and there equipment regularly to is used to mark a remote f oors, CGG survey vessels tow historically have the VAB1250 identify- point. This mark is dis- an array of cables in the water at been numerous ing points at the front, played as a special fea- a up to a 50 f . depth, an array of collisions with the middle and tail of the ture or hazard on a ves- sel’s ECDIS, chart plotter cables that contain seismic energy streamers resulted spread of streamers or AIS display when with- sources, usually a series of airguns in a high loss of both and on the outer cables. in range. The ship’s on- that are f red at regular intervals equipment and pro- T ese points are then board equipment is then as the vessel moves along prede- ductivity. displayed on any AIS- able to alert crews to the termined survey lines. Energy re- It is hoped that by equipped ECDIS, chart presence of and if they are on a collision course f ected from beneath the seaf oor using Vesper Ma- plotter and radar with- with the marked naviga- is detected by numerous ‘hydro- rine’s Virtual AIS in a range of approxi- tional hazard. phones’ contained inside long, Beacons to broad- mately 20nm.